We are saving, we are saving - sing along there. It’s something we all promise we’re going to do and then we forget and spend the money on something else. Over the years, I’ve managed to get into the habit of saving a small amount regularly so I have an emergency fund and it gets raided regularly despite my best intentions. Last year there was the curious case of the leaking immersion, the day that Hubs impaled the car on a giant gate and the garden gate disintegrating. It’s all about the money. Last month, I saw an article online about an American lady who decided to save, a dollar at a time, to create a little nest egg and I was hooked. The idea is really simple. Start with just €1 on Week 1 (£1, $1 or whatever currency you’re using). Put it into a jar. The next week, put €2 into the jar and increase your contribution by €1 every week. If you keep this up for a year, you’ll have the princely sum of €1,378 in your jar to spend on whatever you want or need. Even though you’ve missed Week 1, you can start the plan right now. 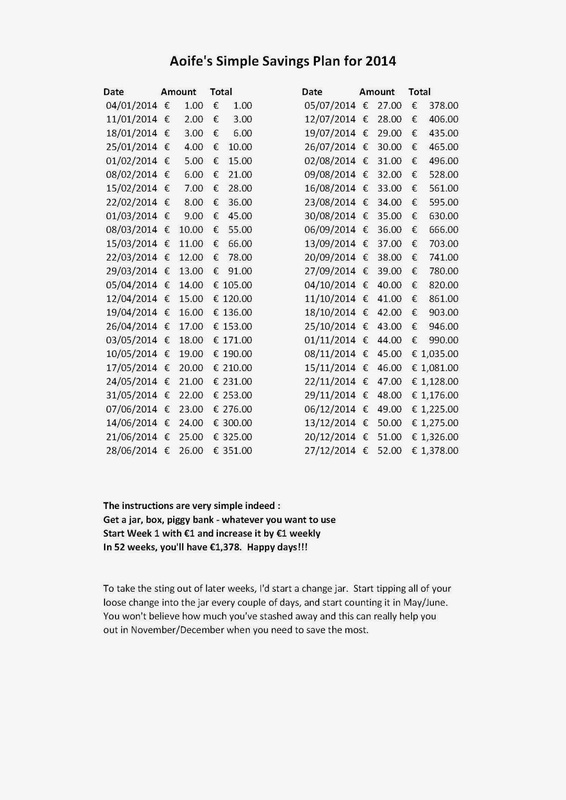 Print out my savings sheet, stick €3 into your jar and look, you’ve already reached Week 2. Think of how rich you’re going to be at the end of 2014!!! Both myself and The Hubs have started (in my vintage Terry’s Neapolitans tin) with €1 each on Week 1. If we keep this up, he’ll have enough to pay his car tax and insurance when they both land in November (the expensive month) and I’ll have enough for something frivolous, or practical, or even both. I’d love to know what you plan to do with your savings – go on, tell me! Such a good idea. I bought some jars in Ikea one of them will work perfectly. Such a good idea, but tell me - aren't the last few weeks really hard? Yeh saw that after I posted the comment, sorry! Have seen lots talking about doing this! Great idea and I'm going to give it a go but am thinking of alternating weeks to lessen the pain of the second half of the year - so one week put in amount from top of list and second week the amount from bottom and work forwards and backwards until they meet in the middle :) will be great to have a few quid saved at Christmas or even when I need to fill the bottomless oil tank next winter.